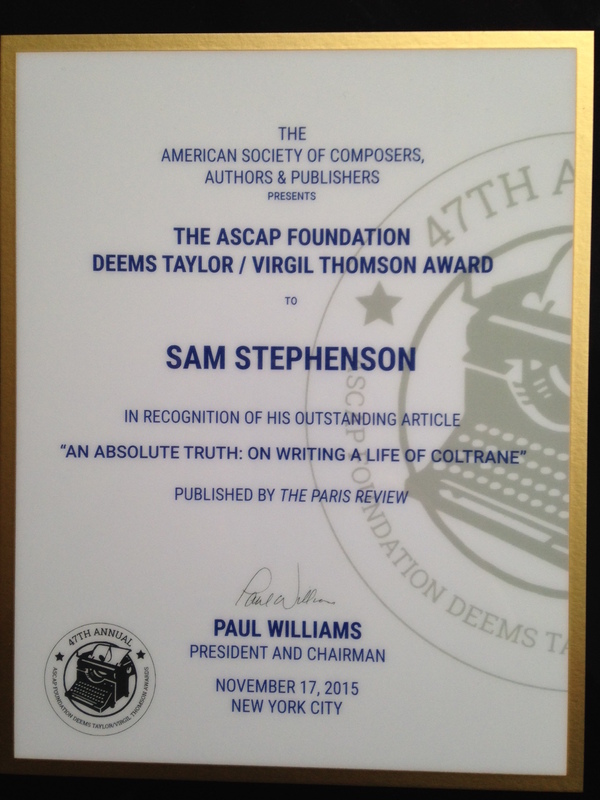 This week Sam Stephenson was in NYC to receive his 2015 Deems Taylor / Virgil Thomson Award from the ASCAP Foundation for his piece on John Coltrane’s biographer, Dr. Cuthbert Simpkins, for The Paris Review. The esteemed pianist and composer Matthew Shipp presented the award with a few much appreciated words. Courtesy of ASCAP, with permission from Shipp, here is that transcript. (The other North Carolinian referenced here is John Jeremiah Sullivan, whose award for his New York Times Magazine piece, “The Ballad of Geeshie and Elvie,” was presented just prior). We now honor another fine North Carolinian author, Sam Stephenson, recognized with this award just two years ago for his work on the multi-media effort known as The Jazz Loft Project. This time we honor him for an article that was published in The Paris Review titled “An Absolute Truth: On Writing a Life of Coltrane.” Mr. Stephenson writes about a 1975 book, Coltrane: A Biography, and its young, self-published author at the time, Cuthbert Simpkins. Simpkins was neither a musician nor a writer – he was a black medical student who was so moved by Coltrane’s music that he decided he had to learn about the great musician by writing his biography. After spending time with Dr. Simpkins and his family in Shreveport, Sam Stephenson captures the essence of what drove Dr. Simpkins to write his book and makes the case for its lingering importance. Of all the years I’ve been on this panel, this is one of the most unusual articles I’ve read. Instead of writing directly about a musician it goes after an obscure author of a bio on Coltrane, but in so doing it touches on so many things in the author’s life and on Coltrane, including really getting at the place that Coltrane occupied in both spirituality and universal consciousness and Black consciousness in the 1970s. Sam Stephenson is with us tonight and accepting for The Paris Review is managing editor, Nicole Rudick.